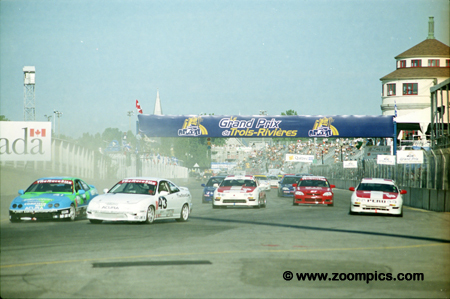 Round nine of the 2001 Grand-Am Cup Championship was a 2.5-hour race held on 1.5-mile Trois-Rivieres street circuit. 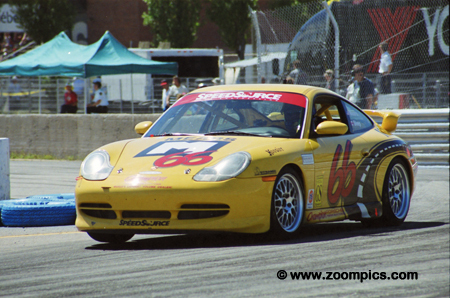 At Trois-Rivieres, it was decided that the SGS class would race, for the first time, with the Grand-Am GT cars. This decision was made after only eleven GT class cars were entered. Although they only qualified eighth the No. 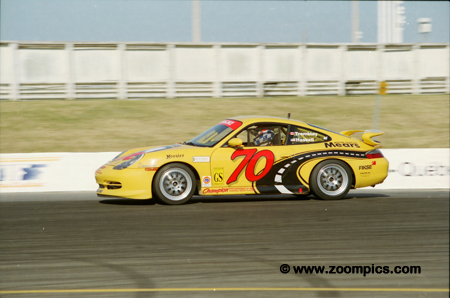 66 Speedsource Porsche 911 was able to take the overall and Grand Sport victory at Trois Rivieres. Sylvain Tremblay and Paul Mears Jr. shared the car. This win was particularly rewarding for the Speedsource team as the company principal, Tremblay, hailed from nearby Amqui, Quebec. 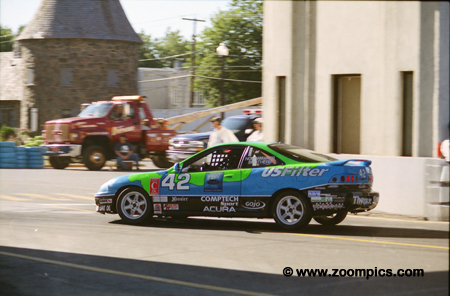 Two of the top C2K qualifiers from the Planet Earth Motorsports team (Acura Integra GSRs) lead the remainder of the field through Trois-Rivieres’ very quick first corner. 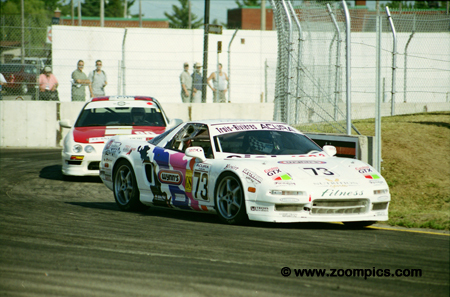 Behind them are the Spirit of Miami Acura Integra Type Rs which started eighth and ninth in the Sports Touring class. The No. 77 Power Team Racing Acura Integra Type R was not as bad as it looked. 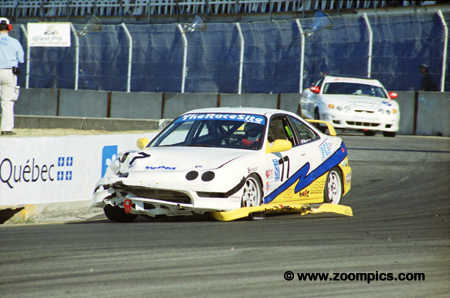 An incident early in the race rearranged the body work but the team was still able to continue and managed a second place finish in Sports Touring. The car was shared by Bob Endicott, Peter Schwartzott and Mike Keravich III. The blue paint on the right front of the TF Racing Ford Mustang Cobra R is an indication that there was contact with the tire wall. The incident occurred early in the race and the damage to the car was only superficial. The drivers, John Kohler and Tom Houk, were able to finish sixth in Grand Sport. Sylvain Tremblay started on the pole in the No. 70 Speedsource Porsche. He opened up a comfortable 45-second lead before pitting at the midway point. David Shep took over the driving duties and when the No. 66 Speedsource car stopped for refueling he replaced Paul Mears Jr. A caution period bunched the field and he passed the No. 70 Porsche – which gave Tremblay a first and second in Grand Sport. The No. 42 Planet Earth Motorsports Acura Integra GSR qualified seventh in the C2K class - well behind the other two Planet Earth cars. 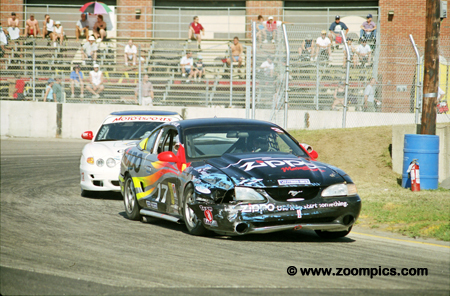 After several of their competitors experienced accidents or mechanical failures the drivers of No. 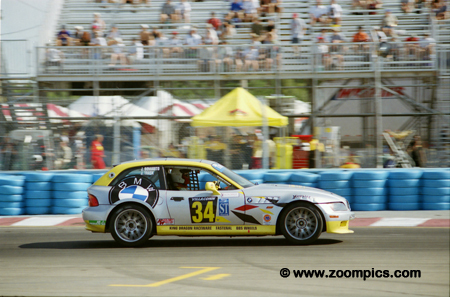 42 – Wayne Nonnamaker and Frank Del Vecchio – found themselves second in C2K and seventeenth overall when the checkered flag fell. The winner in the Sports Touring class was the Villaconn International BMW Z3 Coupe of Jeff Trask and Jonathan Bomarito. This was the team's second-straight class victory. The previous round at Road America was the site of Villaconn International's first win. And, for the nineteen-year-old Bomarito, it was only his third Grand-Am Cup race. The Canadian Hyundai Motorsport team were the fastest qualifiers in C2K. Putting the No. 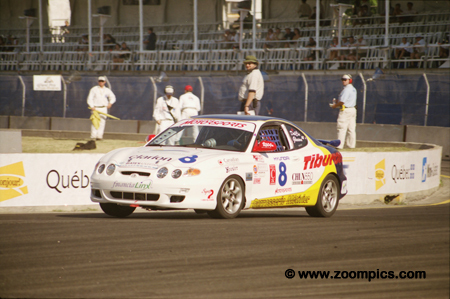 8 Hyundai Tiburon on the pole was Paolo Dal Cin - he shared the driving with Nigel Gleeson. The pair dominated the event until brake problems late in the race forced them to pit. Trouble changing the brake pads dropped them out of contention – sixth in C2K and twenty-fifth overall. The Hebert/Theetge Motorsport team from Quebec had their best results of the season. During practice, the Acura NSX which was driven by Jocelyn Hebert and Benoit Theetge had their fifth engine failure of the season. A local Acura dealer loaned them a used NSX with 50,000 km. The team swapped engines the duo started and finished third in Grand Sport. The Planet Earth Motorsports team finished first and second in the C2K class. The No. 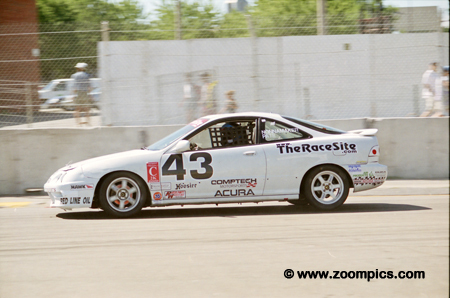 43 Acura Integra GSR was driven by Will Nonnamaker and team founder Bill Pate - scored the victory. Frank Del Vecchio and Wayne Nonnamaker shared the second place car. 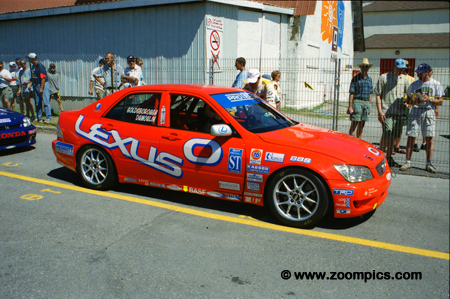 There were two of the new Lexus IS 300s entered at Trois-Rivieres. The No. 0 was driven by local resident Jean-Francois Dumoulin. 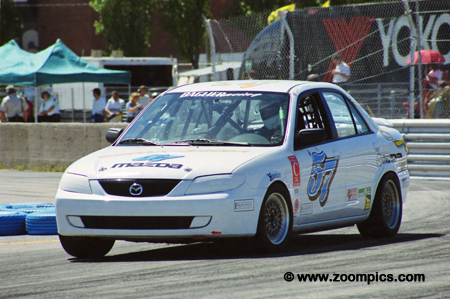 He and team owner Chuck Goldsborough would start third in the Sports Touring class. Dumoulin drove the first stint and was second when Goldsborough took over the driving. Nearing the end of the race a rear wheel bearing failed which dropped the car to third in class. 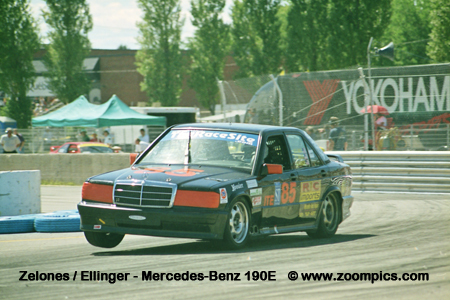 Another team having their best finish of the season was the Baglieracing Mazda Protégé of Dennis Baglier and Marty Luffy. Like the third Planet Earth Motorsports entry, they were able to capitalize on the misfortunes of their competitors and finish third in C2K.